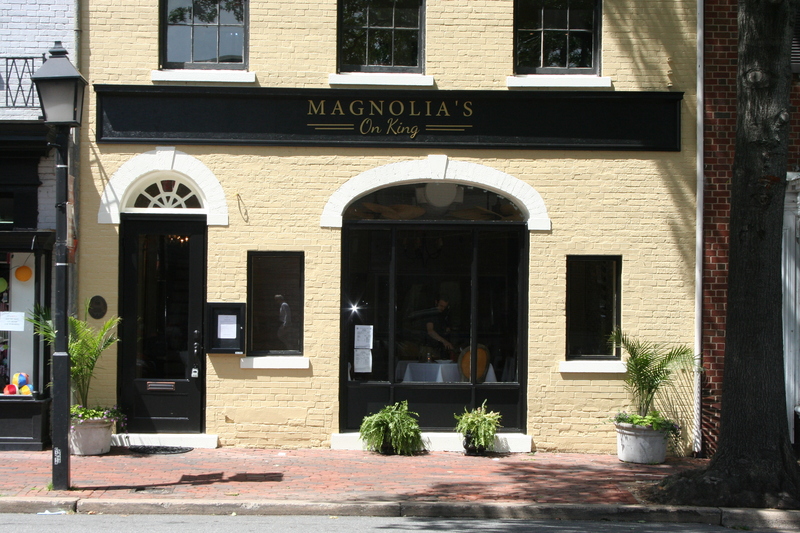 The new Magnolia’s on King, 703 King St, Alexandria, is an inviting, warm restaurant great for an intimate night out. The 60-seat restaurant from first-time restauranteurs Steve Fogleman and Mehrnoosh Rajabi serves “Southern Immersion” cuisine with a side of Southern Hospitality. The Palm Lounge upstairs is a great place to start your meal with cocktails and appetizers or finish with a nightcap and dessert. There is also live jazz music up there on Saturday nights. Both floors are decorated with golds and deep reds and have the famous southern palm ceiling fans. 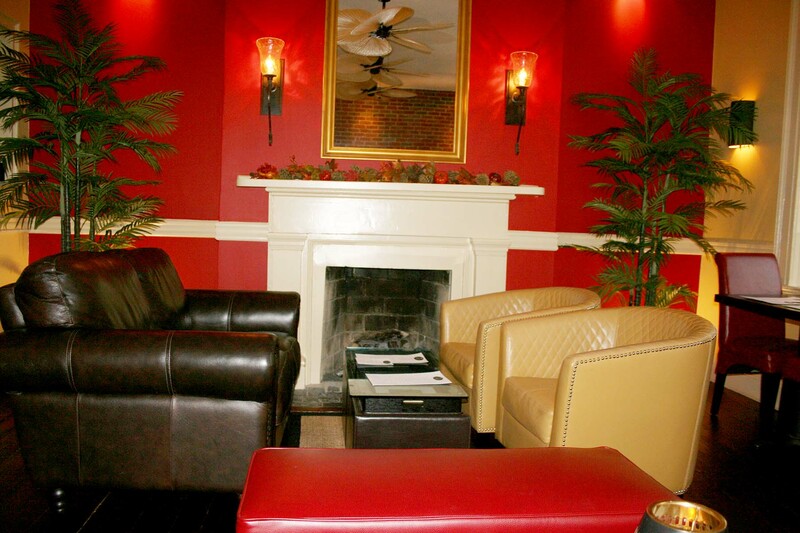 The lounge and bar has an exposed brick wall and fireplace while the entrance and 30-seat dining room includes a pineapple chandelier and natural-toned stones on the wall. And while the setting may be perfect, the food is hit or miss. The menu has only four appetizers, seven entrees, four sides and three desserts, so you expect the chefs to offer their best. But during a visit last week, some of the dishes were top-notch, while others had to be sent back. 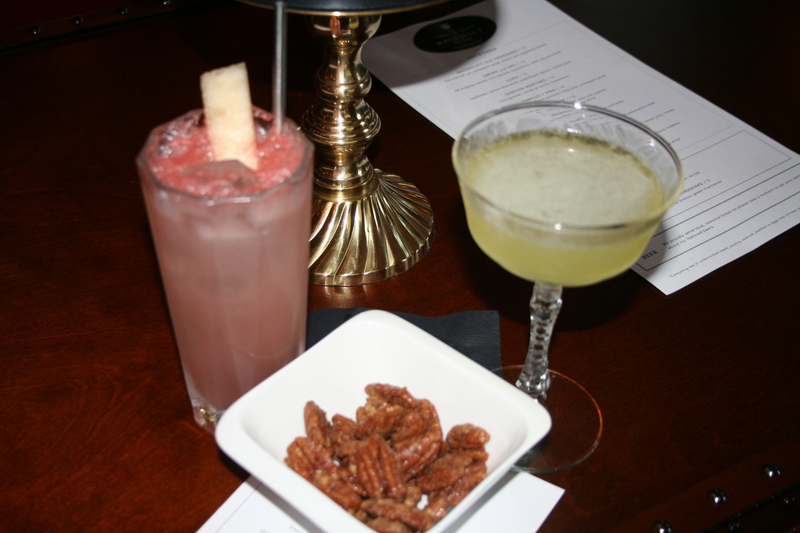 My guest and I started with appetizers and cocktails in the Palm Lounge. The Porch Swing ($12) made with Sobieski vodka green chartreuse, lime juice and house-made watermelon soda and pickled watermelon rind from craft mixologist Zachary Faden, formerly of Rogue 24, was refreshing, while the Coda ($15) with Beefeater, yellow chartreuse, elderflower liqueur and lemon juice wasn’t up to par. I’m not sure if it was the elderflower liqueur, but neither my guest nor I could finish it. My friend likes fruity drinks, not those heavy on liquor, and Faden had recommended both, although neither was particularly fruity, even though he went light on the alcohol. 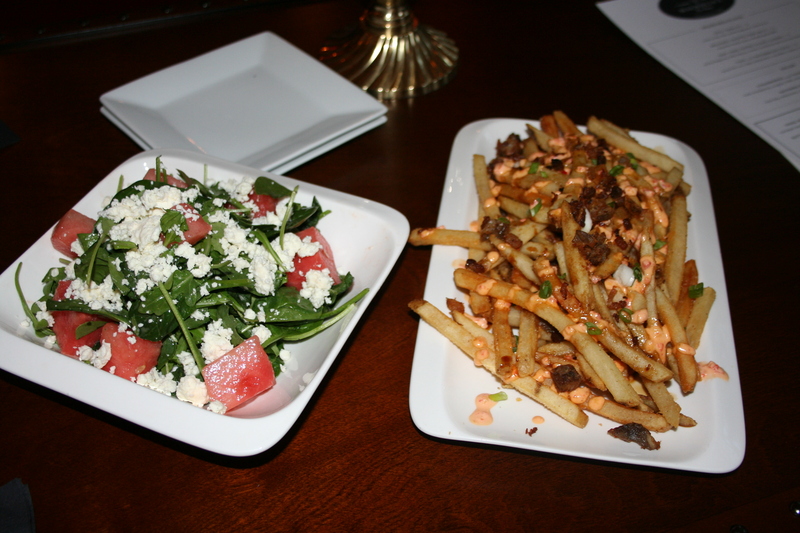 Both appetizers, on the other hand, were spot on – especially the pig fries ($9). The French fries are topped with braised pork belly, green onion, pimento cheddar and a seasoning blend. The only thing that could have made these fries better was more pimento cheddar. The watermelon and feta salad ($8) with baby watermelon, local feta, arugula and Champagne vinaigrette was a perfect balance between the sweet watermelon, salty feta and the peppery arugula. We then headed downstairs to the dining room and our main course. All meals begin with complimentary cornbread biscuits and honey butter. 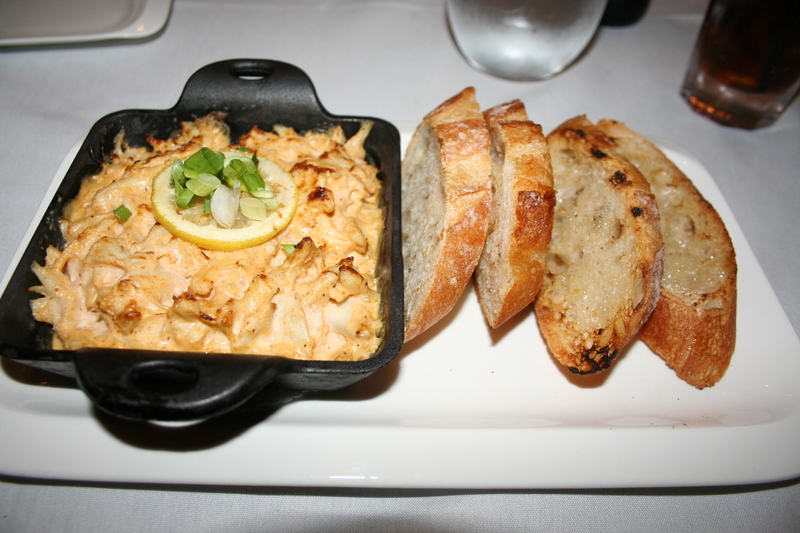 We started with the spicy crab dip ($18) with jumbo, lump crab, a grilled baguette and fried lemon. This was another hit from executive chef Brian Rowe, who formerly worked with Wolfgang Puck and Jacques Ganeu. The top was crusty and the inside rich and tasty and full of big lumps of crab meat. It came with four sl ices to toasted baguette, which wasn’t enough (that appears to be a common complaint in online reviews). We had to order another four slices to finish the dip. For our entrees, my friend ordered the shrimp and grits ($24) made with six jumbo shrimp, cheddar grit cakes, green onions and red pepper aioli. The grit cakes were a delicious twist on the usual creamy grits and the shrimp were perfectly seasoned with a bit of a kick from Old Bay.pi I ordered the bison meatloaf ($20) with herb-infused red wine cream sauce, greens and mac and cheese. Unfortunately, here is where the meal began to slip downhill. I’ve had bison below and knew to expect a drier meatloaf since bison is low on fat. But, it had a strong taste of sage or tarragon that was quite overpowering. On top of that, I didn’t like the greens (which turned out to be Collards) and the mac and cheese tasted more like it was out of a box than baked. There was no crunchy topping and the cheese just tasted like a mild cheddar rather than a mix of cheeses. I sent it back to the kitchen and requested the tasty shrimp and grits instead. Rowe came out to apologize and said he tasted it and the prep cook had used too much chipotle so he was throwing it all away and remaking it. It was nice of him to come out, but shouldn’t the executive chef tried all the food before it is served? Other entrees include fried blue catfish ($18) with cornbread and southern coleslaw; buttermilk fried chicken ($18) with a sweet tea brine, spicy honey, mac and cheese and greens; grilled bone-in pork chop ($31) with mashed sweet potatoes, greens, grilled peach and root beer gastrique; a “Denver” steak ($37) with green peppercorn cruse, au jous, sweet potato puree and greens; and eggplant and mushroom cassoulet ($17) with seasonal mushrooms, local eggplant, black-eyed peas, white wine and sweet potato puree. They also appear to have frequent specials, which are posted on Facebook and Twitter, but our server didn’t tell us about any during our visit. The shareable sides aren’t particularly healthy with mostly starches on the menu. They include the baked mac and cheese ($6) with house pork rind dust; grits ($5) with cheddar and green onion; seasonal local greens ($5) with local ham, fresh garlic and shallots; and mashed sweet potatoes ($6) with brown sugar, cinnamon and bruleed mashmallows, which we ordered. The sweet potatoes were very tasty and the bruleed marshmallows added that extra touch. 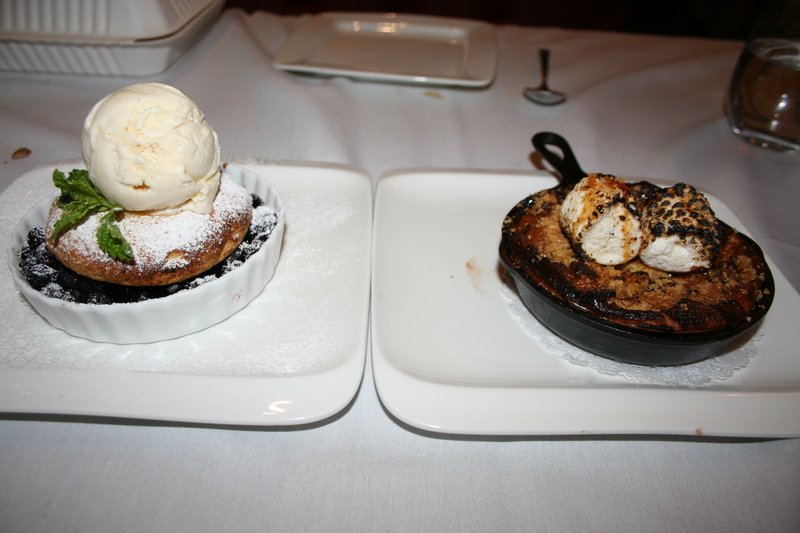 We both got to-go boxes with our leftovers so we had space for dessert. Pastry chef Hans Fogleman – the owner’s son – formerly worked at BLT Steak and Bayou Bakery, so we had high hopes. Unfortunately our anticipation was not fulfilled. The s’mores bread pudding ($7) with chocolate bar pieces, graham cracker, torched marshmallows and whiskey caramel was dry and lacking in chocolate. The best part was the toasted marshmallows on top. The blueberry cobbler ($8) was made with blueberries, cornmeal biscuit and topped with vanilla gelato and powdered sugar. Ours came with a hair in it also. Plus it was made with tarragon, which gave it an odd taste. Needless to say, we didn’t finish either. The other dessert was a hot fudge sundae ($5). Magnolia’s on King, which opened July 1, has the makings of a successful restaurant, although the kitchen has to perfect its dishes and consistency. The chefs need to sample what the line cooks make, and they need to stick to basic Southern dishes without adding their own twists. With only a few good Southern restaurants, dinners will flock in for true Southern comfort food and not some fusion dish. 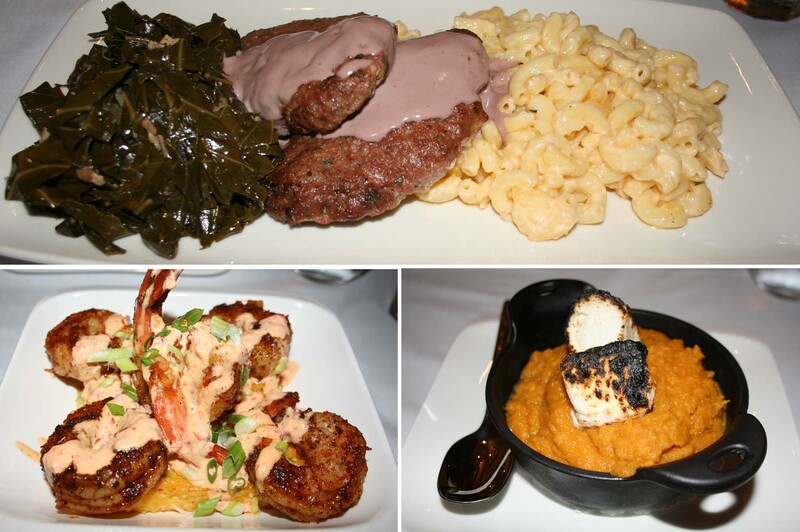 Magnolia’s on King is open 6-10 p.m. Tuesday through Saturday for dinner and 11 a.m.-3 p.m. Sunday for brunch. 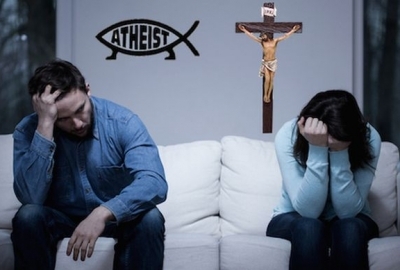 It is closed Monday. The Palm Lounge is open 6-10:30 p.m. Tuesday through Thursday and 5-11 p.m. Friday and Saturday. The lounge is closed Sunday and Monday.